A wedding turns dramatic on the Thursday, April 4 episode of LAW & ORDER: SPECIAL VICTIMS UNIT when a crasher (played by Shiri Appleby) accuses the groom (played by BONES’ TJ Thyne) of sexual assault. After Nikki Staines (Callie Thorne) is attacked on the Thursday, March 21 episode of LAW & ORDER: SPECIAL VICTIMS UNIT, she insists the suspect could be a cop. 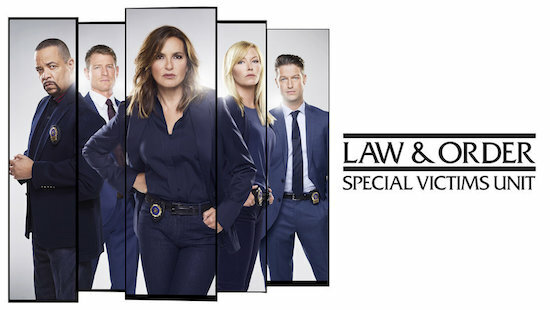 When LAW & ORDER: SPECIAL VICTIMS UNIT returns for its 20th season premiere, there will be a familiar face at the center of things. In the two-part “Man Up”/”Man Down” (airing back-to-back on Thursday, September 27 starting at 9/8c), Dylan Walsh plays John Conway, a self-made beverage distributor…11 years after he played the murderous Malcolm Royce on the long-running crime drama.